The demands of moviegoers are growing - and with them the pressure on cinema operators to enable ever better and increasingly immersive cinema experiences. 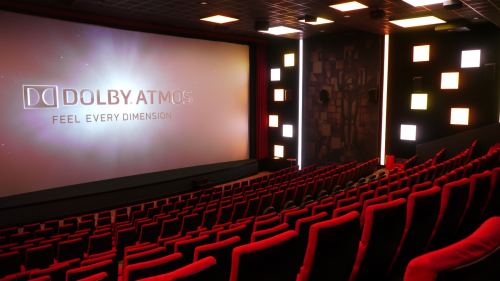 Dolby's surround sound technology Atmos is one of the most sought-after features in the cinema market, and is often integrated into a larger premium concept. "The customer clearly opted for a premium concept and, in addition to the absolute high-quality state-of-the-art picture quality, also wanted an outstanding sound installation," recalls Tammo Buhren, managing director of zweiB GmbH. "ZweiB deliberately supports Alcons as an innovative loudspeaker manufacturer, which we believe offers the best possible quality sound available on the market," said Buhren, explaining his confidence in the Dutch company's products. Unsurprisingly, the specialist in digital cinema technology, event technology and media production trusted Alcons Audio in this extremely quality-conscious project. Those in charge at the Dietrich Theater had also heard of zweiB and their expertise in connection with Alcons Audio. "In the movie industry, the uncompromising quality of the Alcons solutions has gotten around," said Buhren. "At zweiB we are absolutely convinced of the products, and we know that they offer a clear added value for the customer. What we have installed in the Dietrich Theater is simply something different than the standard - and that's what you hear. " "The installation went smoothly," confirms Buhren. And the result could be heard: "We realized an impressive installation at the Dietrich Theater, which sounds really good!" 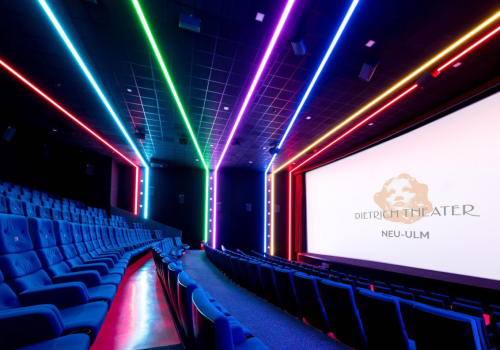 For zweiB it was the first cinema installation with the combination Alcons Audio / Dolby Atmos. Dolby Atmos is meanwhile available for a considerable number of screens worldwide, which means that more and even smaller movie titles are being equipped with Atmos by studios and the market is growing. "Sound localization and the movement of sounds through the room, the key features of Dolby Atmos, are particularly well supported by the Alcons speakers. I firmly believe that Alcons systems better transport the essence of Atmos than other market speakers. " "In the modernization of the Dietrich Theater, our primary concern was to take the cinema experience to the next level and convey a real premium impression to our visitors," explains Sebastian Schmid, general manager Filmtheater at Sailer GbR, operator of the Dietrich Theater. "In addition to equipping the hall with state-of-the-art LED technology, we endeavored to use state-of-the-art picture and sound technology. That's why we opted for a Sony SRX5151-DS (Double Stack) projector and a Dolby Atmos installation with Alcons speakers. Our customers and ourselves are very enthusiastic about the very natural and powerful reproduction in all frequency ranges. That's why we decided to equip Kino 9 with the same technology. " Charlie Nedeltschev, Managing Director of Videocation, adds: "With these installations we consider the cinemas 8 and 9 of the Dietrich Theater as two of the leading halls in Germany. There will be hardly any better sound experiences in combination with this projection quality. Of particular note is the excellent cooperation with zweiB and Alcons, who have handled this project in a very professional way. "